Walking around Maybee, Michigan on a little photo expedition, we happened across Barker's Trading Post and Auction. They open on occasion for actions, but we were given a private viewing of a few items in their shop as they started to prepare for another auction that following week. 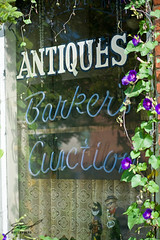 This place was a treasure chest and we'll be back to check out one of their auctions as time permits.